We recently overcame our long-standing aversion to reviewing wireless extenders with two roundups. The Single Band Wireless Extender Roundup covered N300 class 2.4 GHz-only products, while the Dual Band Wireless Extender Roundup tested dual-band N600 products. NETGEAR appears to be a true believer in the value (or at least the sales potential) of wireless extenders and announced two AC class models at CES in January: the wall-plugged EX6100 AC750 WiFi Range Extender; and the EX6200 AC1200 High Power WiFi Range Extender desktop model that is the focus of this review. As its name implies, the EX6200 supports maximum link rates of 300 Mbps in the 2.4 GHz band and 867 Mbps in 5 GHz. Its two radios can extend your network in both bands simultaneously or use one radio as a "backhaul" to the router or AP being extended while the other is used to connect clients. NETGEAR calls this capability "FastLane", presumably because it avoids the 50% retransmission throughput penalty imposed by the basic wireless extension process. NETGEAR has endowed the EX6200 with a nice assortment of status LEDs as described in the graphic below. Since proper extender placement is the key to success with these products, the Link Rate lights use color to indicate "optimum", "good" or "poor" connection between the extender and the base router / AP. Since I am partially red / green color blind, I didn't pay any attention to the lights, whose colors were even more difficult to make out being behind a dark-tinted plastic panel. Although it would have cost a bit more, three separate LEDs for each indicator would have been more helpful. The two dual-band 5dBi antennas are actually attached via RP-SMA connectors. But they are screwed on very tightly and you may need pliers to get them off, should you want to. 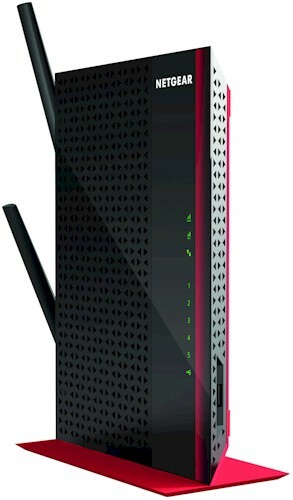 Since the EX6200's design is likely very similar to that of an AC1200 router, the fifth Ethernet port that would normally serve as a WAN connection becomes another LAN port (all are Gigabit). There is also a single USB 3.0 port on the front panel of the router that supports NETGEAR's ReadySHARE USB storage and printer sharing. NETGEAR is blocking the internal FCC doc photos until late May 2014, so I opened up the EX6200 after testing was completed. It's a Broadcom-based design with an interesting third internal antenna that I can't quite figure out how it is connected. Both the 2.4 and 5 GHz radios appear to have external power amplifiers. The processor and RAM are under the pinned-on heatsink. But given the space available and the absence of other visible components for USB 3.0 and switch, I'm guessing the main processor is a Broadcom BCM4708A or A1. I managed to find 8 MB of Macronix flash on the underside of the board.